The 2.5 hours courses will be delivered by an expert British Red Cross trainer and will cover topics that typically concern parents such as delivering CPR, choking and burns, and Meningitis. Every parent has worries about facing an emergency situation involving their child. These courses will address your fears giving you lots of practice in lifesaving techniques and plenty of opportunity to ask questions. Babes in arms are welcome to attend. This is a great opportunity for those wanting to learn more about first aid for children, particularly as we come to the time of year when families get together and there’s lots of excitement in the air. Previous attendees have said they’ve really benefited from the course and felt much more confident knowing what to do should a situation arise where first aid is required. The price for an individual booking is £25.00. The price for a couple booking is £45.00. A limited number of concessionary places at £10.00 are available to qualifying attendees on a first-come-first-served basis. 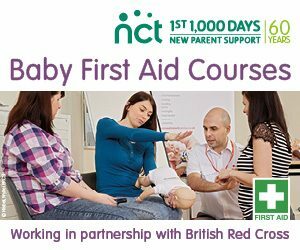 Email firstaid.stockportanddistrict@nct.org.uk for more information.